Have you noticed there is a trigger factor for every post that comes up on this blog, of late? 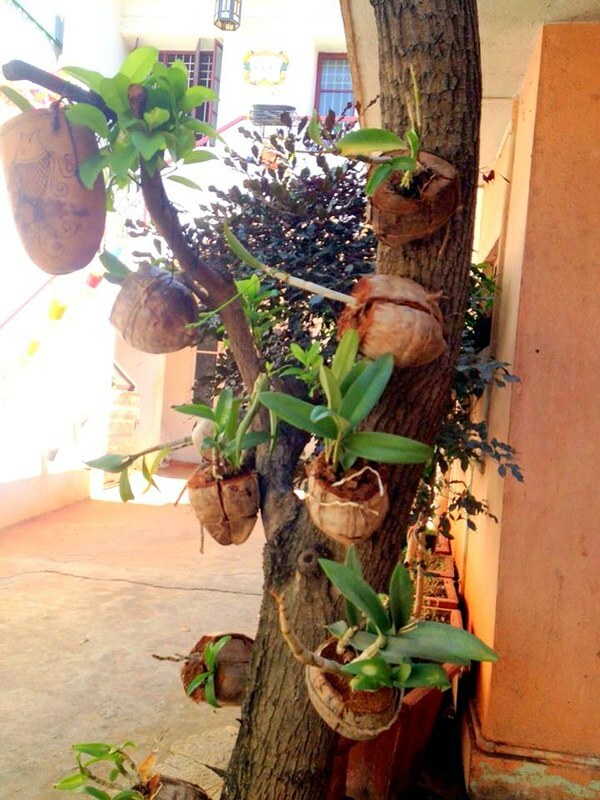 In the image below, the coconut husk planters filled with coconut chips and charcoal, are secured in place with a coir rope and tied around the bark of a sapota tree. If this isn’t brilliance exemplified, then I don’t know what it is. I couldn’t stop myself from reaching out to Sanjana on seeing this picture. Shall we meet the person – Sanjana Govindan Jayadev – who understands the power of keeping it simple? Here are some excerpts from a free-wheeling conversation with Sanjana. 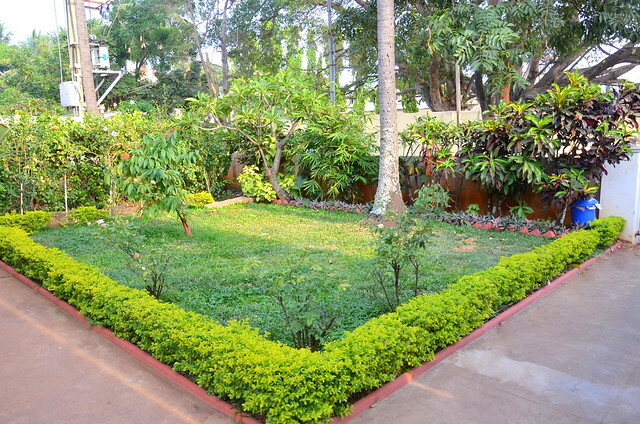 The text is interspersed with images of her lush green, healthy, and well taken care of garden in Bangalore. 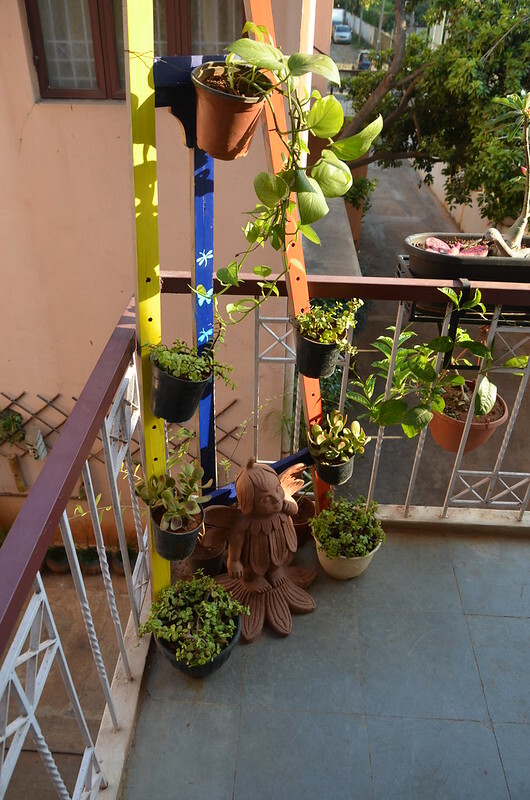 Sanjana, do you have a daily regimen when it comes to tending to plants? I have a gardener who waters all the plants and sweeps up dried leaves etc. I spend an hour everyday on the garden and usually on a specific area. I have a wide range of plants and a shade garden as well as a garden full of sunshine. My regime involves – fertilizing my orchids and roses with natural fertilizers, loosening the soil and multiplying plants. I use NO chemicals at all in the garden. This is because my garden is full of children , animals and birds all the time. I even have a patch of palms that is filled with live caterpillar cocoons ( it’s my favorite thing to show children). Even the slightest change in the soil, temperature of lighting will kill all of them. I love multiplying my plants, because i give away a lot of plants. My garden was more like a wilderness of weeds when i took over. Every member of my family has bought me plants at some point and so my garden grew because of the kindness of a lot of people. My help, one morning bought me a huge haul of plants because her husband was the electrician at a marriage hall being torn down and so he took the plants to bring to my garden. So , paying it forward is my way to making my garden grow. 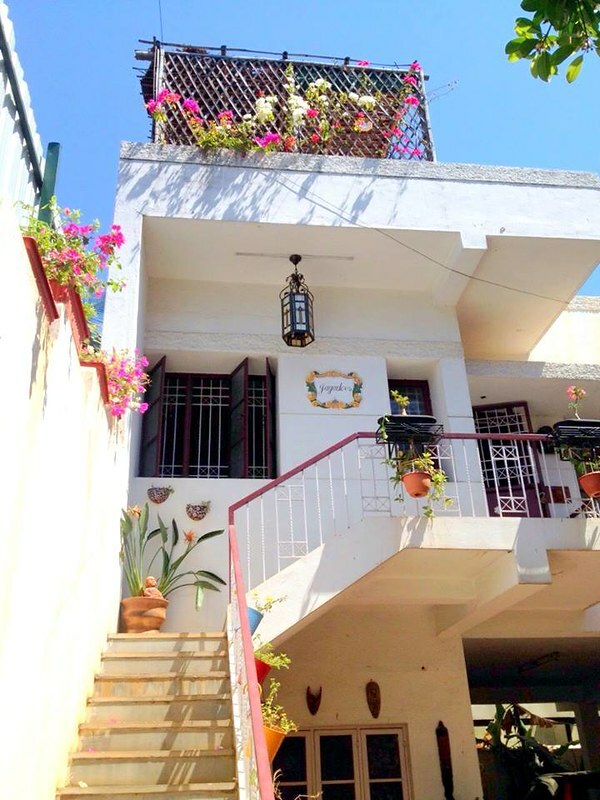 I moved to Bangalore with a 2 month old and I really wanted some place beautiful and lush to play with my daughter. I had also just dropped out of my PhD and was figuring things out. Gardening is very therapeutic like that. Also, I love animals and rescue all sorts of creatures ( including a baby bat) and the garden serves as a refuge for them. 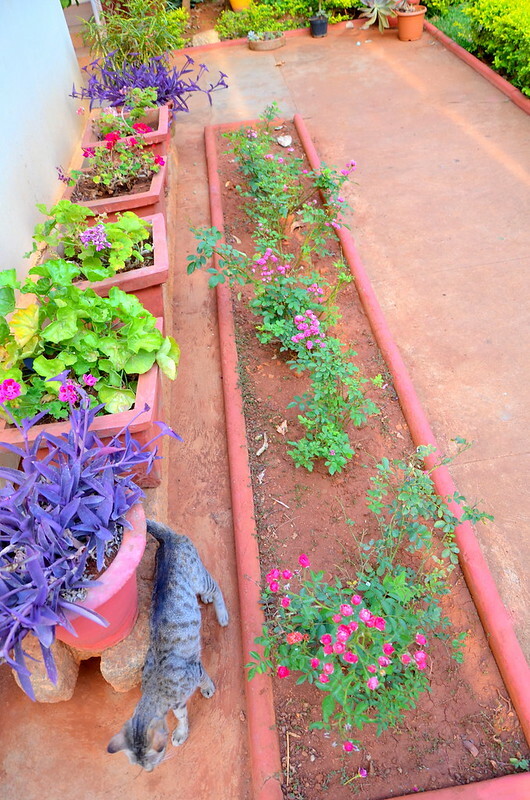 Finally, serendipity played a huge part too – I live in Jayanagar so acquiring plants along with the training was easy. I remember in the early days i would go with dead plants and mud and ask the nurserymen what i did wrong. Give us a sense of your garden layout. As you enter the gate , there is a garden1 on the right hand side ( its a little lawn ) with old plants. I inherited the home and garden from my grandmother and so i didn’t want to kill/remove anything she had planted. So there are some really old roses and crotons amongst other things. 50 meters down the driveway is my home. 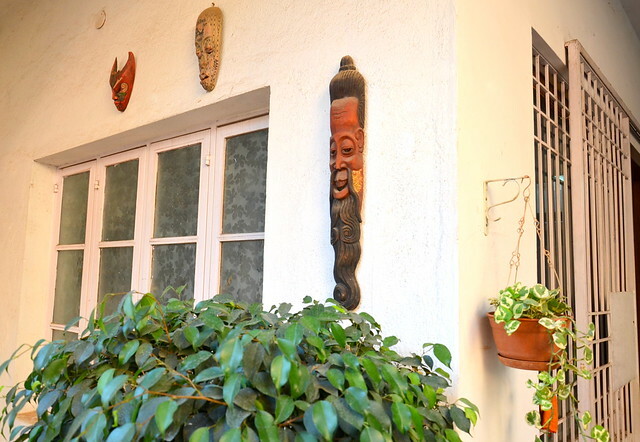 there is another little garden on the right side with a sapota tree and orchids . Downstairs is our home office and upstairs is the living area. I love geraniums because of how hardy and beautiful they are. I love to plant them, dry the flowers and even sketch them. I also enjoy orchids and have a small but growing collection – Finally, I like plants that have a non green foliage ( oxalis , purple heart etc). I enjoy growing Pilea, string of pearls and adendium. Any story about the plants you had difficulty in growing but didn’t give up. Believe it or not, I have a great deal of trouble with roses. I couldn’t figure them out for a long time. I now have a whole bed of little teacup roses and they are doing well. I see you are particular about the planters you use as well. Any special picks? Would you like to share resources (nurseries from where you pick seeds, potting medium etc)? 3. Mud – its really important to get this bit right and i have gone through a ton of recipes for potting mix. I buy red mud from siddapura, vermicompost from lalbaugh and horse/cow manure from siddapura as well. I don’t know the names of the vendors but i am happy to share their location. 3. Seeds – organic garten for heirloom greens ( I don’t like hybrid seeds ). 4. 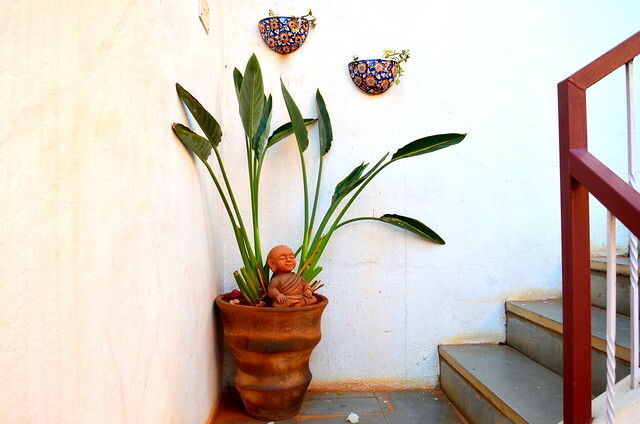 Planters – Maati, Shashi Bagchi who has a beautiful garden herself. 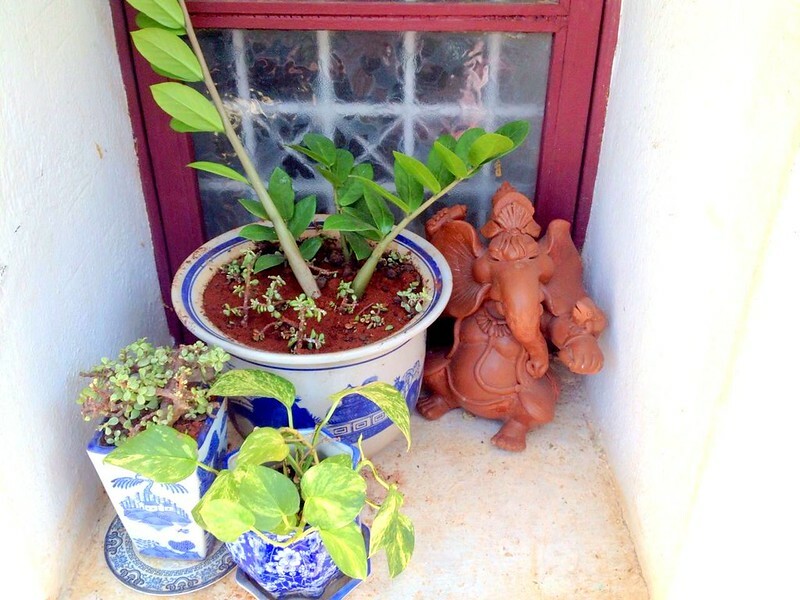 The terracotta Ganesha is from Bali, Indonesia – the reason behind his predominant east-Asian (read: thin) features. a. Jizo Statue – Jizo is the japanese monk who protects, women ,children and travellers. I love everything about Jizo and was delighted when i found him. 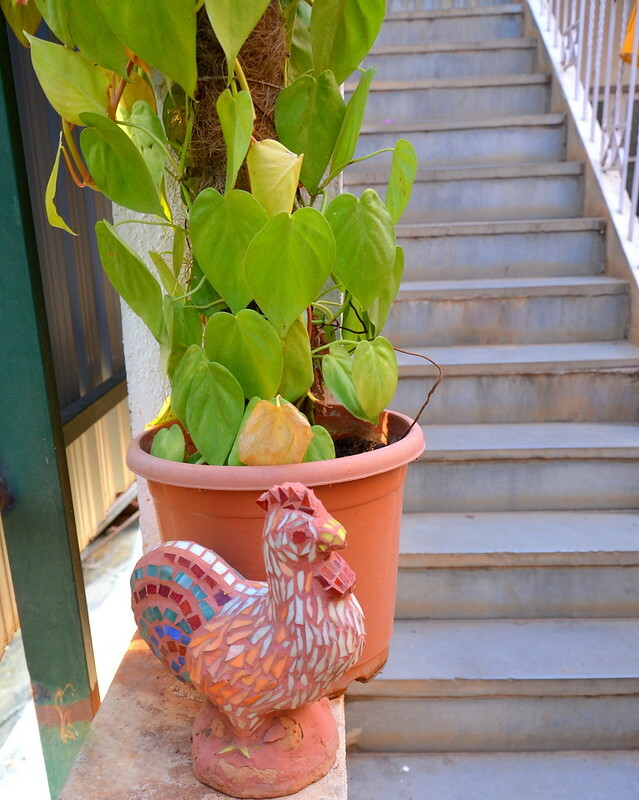 He sits on my landing under a bird of paradise plant. b. I also love the garden pixie – made by Shashi. who stands outside my door under a converted easel. c. The masks are from Sri Lanka and Bali. I took them off my mothers mask collection. d. My name board is custom made in Goa by Azulejos artists – a dying indo – portuguese art form. 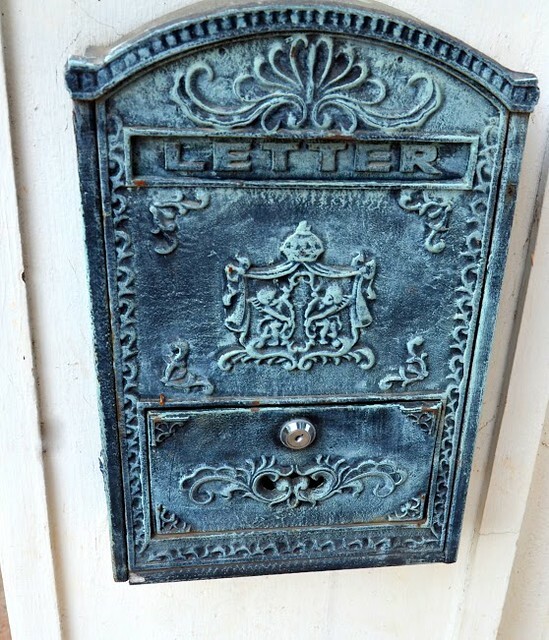 f. My mail box is a cast iron antique , which weighs a ton and is from a flea market. 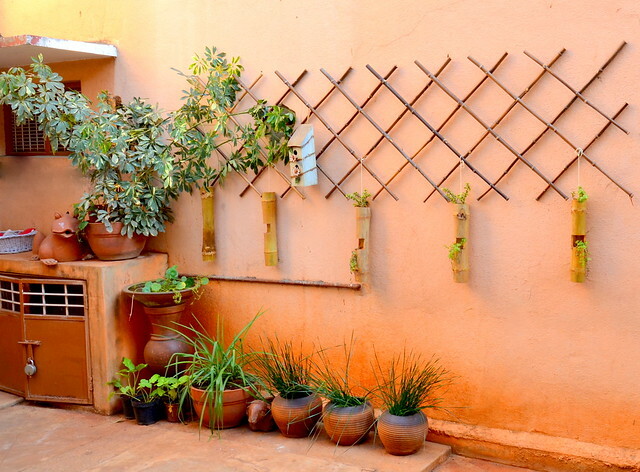 I leave you with a few words of wisdom from Sanjana for all you garden enthusiasts: Finally, the best thing i have learnt is to – take it slow. Someone once told me it takes at least 5 years for your garden to start looking like a garden. Thank you Sanjana for being generous in sharing your experiences and sourcing information with us. If you have any questions for Sanjana, please ask them in the comments section. Truly loved the post Lakshmi. Awesome garden Sanjana. .Just viewing your garden was like therapy. Thanks for stopping by, Sangitha. I know, isn't it a lovely garden – especially the coconut husks.